The best croutons are made from slightly day-old bread. I had a loaf of tomato-basil sourdough from a local artisanal bakery but you can use a baguette or regular store-bought rolls. Slice thickly, about 1/4″ minimum. Trim off the crusts if you want (this is purely a matter of aesthetics); I don’t, unless I’m cooking for a crowd. Melt 1 T. unsalted butter in a skillet over medium-low heat. Add bread cubes. Stir. Toss cubes until lightly golden brown. Remove from heat and set aside. Melt 2 T. unsalted butter in a heavy skillet or Dutch oven. Add the onion, carrot, celery and celery leaves. Lower heat and cook, gently stirring until vegetables have softened, about 10 minutes. I like to add a pinch of salt about 1 minute after adding the vegetables. It helps the vegetables exude more liquid and caramelize sooner. Add kale along with the bean cooking liquid. When greens have wilted, add the cooked beans and simmer, adding more bean cooking liquid as necessary. If you find the mixture too thick, add some water or vegetable stock to thin it out. Cook until the greens are done, roughly 15 minutes. Check seasoning. Stir in tarragon. Divide portions amongst soup bowls. 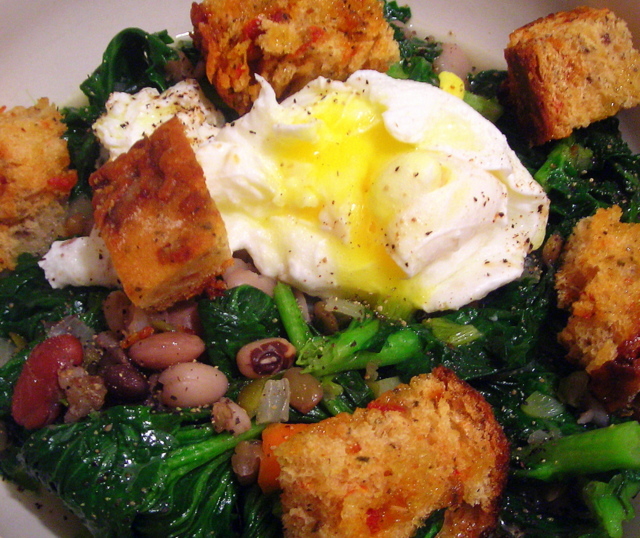 Top with a poached egg and some croutons. Drizzle a little extra-virgin olive oil and serve immediately. (1) — I used the last of my stock of heirloom beans from Rancho Gordo but any dried beans will do. Place 1 cup beans in a heavy bottomed oven-proof pot or Dutch oven along with 6 cups water. Bring to a boil, then place in a pre-heated 350 F oven and cook for 90 minutes. Beans should be tender or close to it. If you think they need more time, add a pinch of salt and extend oven-cooking time by another 30 minutes. You can cook the beans a couple of days ahead of time. That way the prep time won’t seem so onerous. This recipe appeared on Queer New York. 30 Mar	This entry was published on March 30, 2010 at 10:07 pm. It’s filed under food, general, Italian food, vegetarian, winter and tagged dinner, heirloom beans, kale, seasonal and local, vegetarian. Bookmark the permalink. Follow any comments here with the RSS feed for this post.